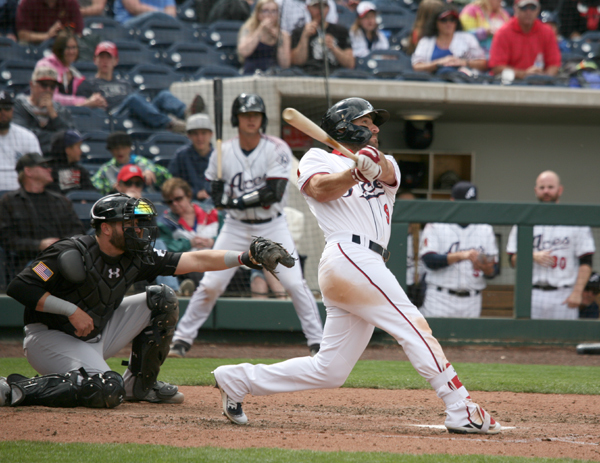 Reno Aces center fielder Andrew Aplin takes a cut during Sunday’s game with El Paso. 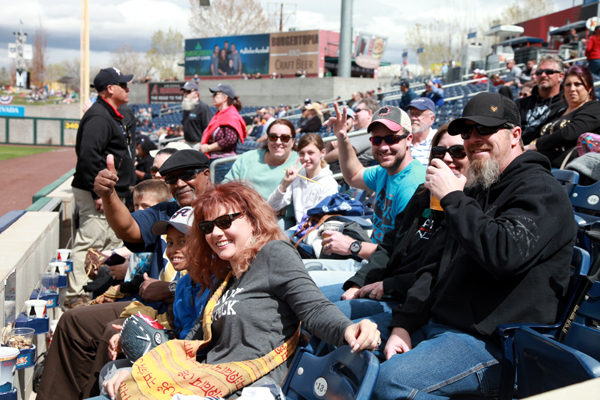 The El Paso Chihuahuas didn’t need a come-from-behind win in a 12-4 rout of the Reno Aces Sunday at Greater Nevada Field. 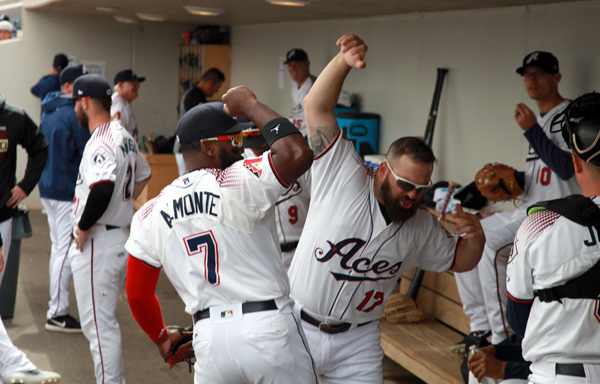 Following back-to-back comeback victories over the Aces, El Paso scored seven runs in the fourth inning to put the visitors up by 11 runs by the sixth. The Chihuahuas have won the first three games of the four-game series, scoring at least six runs per contest. El Paso’s 5 through 8 hitters in the order combined for 6-for-15 with two home runs, six RBIs and six runs. Starting pitcher Jerry Keel recorded his first win of the season. He gave up one earned run, five hits and six walks in five innings. Taylor Clarke was roughed up early in his third start. 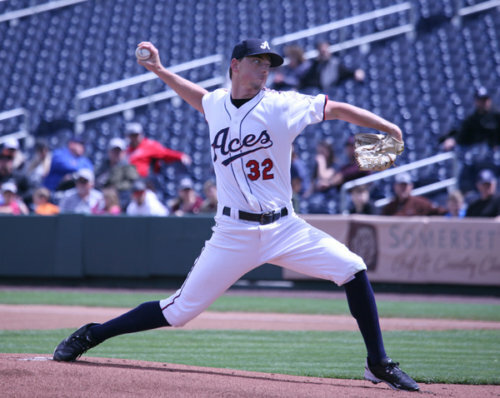 Aces starting pitcher Taylor Clarke had a rough outing on the mound. The right-hander allowed eight earned runs on seven hits and two walks in 3.2 innings pitched. Clarke’s command and location led to his early exit. El Paso right fielder Jose Pirela crushed Clarke’s hanging 85 mph slider over the scoreboard in left field. Left fielder Josh Naylor cranked his high four-seam fastball over the right field party zone in the third inning. The Aces’ bullpen couldn’t stop the bleeding. Lefty relievers Marc Rzepczynski and Alex Young surrendered a combined four runs in 3.1 innings. 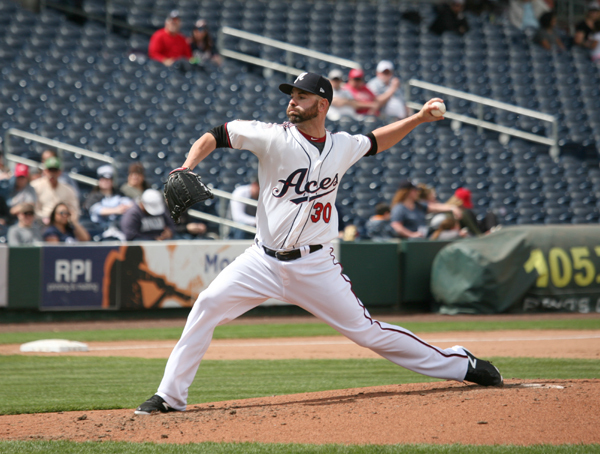 As a unit the Aces’ bullpen sports a 7.55 ERA through 11 games. Needing the work, closer Jimmie Sherfy pitched a shutout eighth inning in relief. The Aces’ all-time saves leader is one shy of 50 career saves in the Biggest Little City. Two shy of 200 career homers, Cody Decker started in left field, moved to right in the sixth and pitched a shutout inning of relief in the top of the ninth. His fastball was so slow, the radar couldn’t record the speed. Reno recorded 12 hits. Abraham Almonte went 1-for-4 with a double. His six doubles on the year leads the Pacific Coast League. Yasmany Tomás 2-for-5 with a double and RBI. Domingo Leyba and Marty Herum added one RBI apiece. Kevin Cron, who finished 1-for-2, was just 10 feet shy of his third home run of the season that hit off the 410 mark in center field. He settled for a double. The Chihuahuas jumped out to a 2-0 lead off Pirela’s two-run blast. Reno loaded the bases in the third inning, but failed to come away with a run. El Paso poured it on in the fourth with a seven-run, six-hit inning. 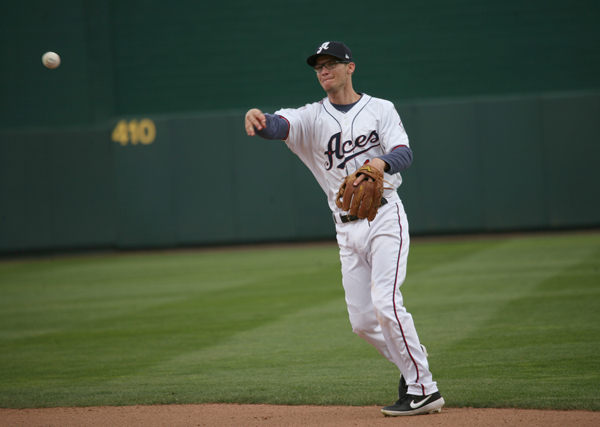 Tomás’ RBI double in the fifth cut the Aces’ deficit to 9-1. The Chihuahuas tacked on two more runs in the sixth. Both teams recorded one run apiece in the seventh inning. 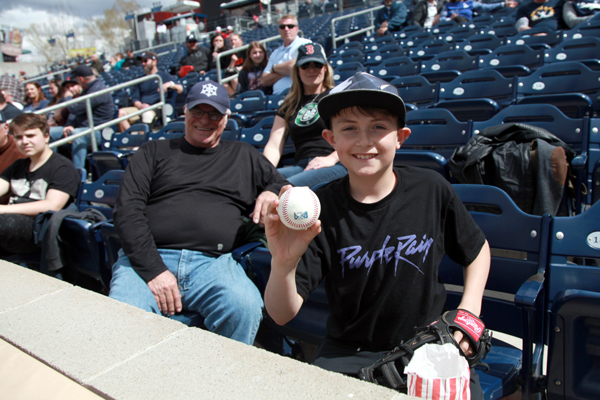 Reno added one more in the bottom of the eighth off Herum’s RBI single. Notes: El Paso’s Jose Pirela is 7 for 11 in the series with a home run, three double, three runs and nine RBIs. 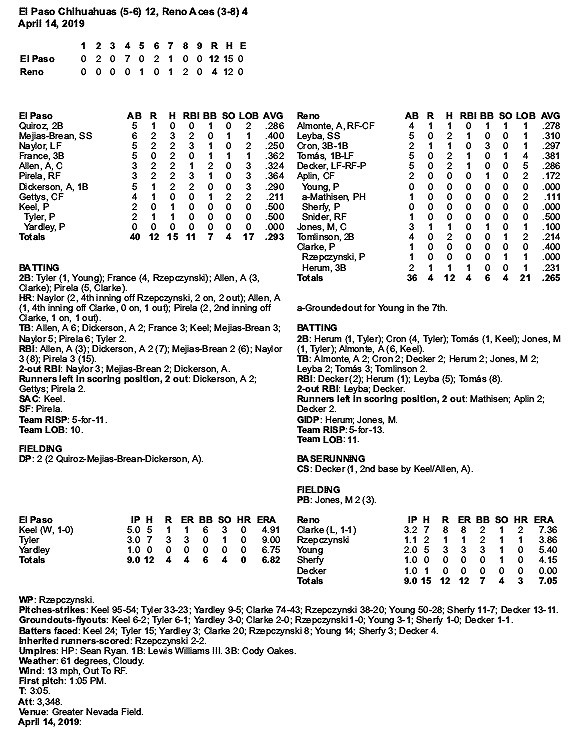 … Both teams combined for 13 walks. … Travis Snider has a six-game hit streak. He’s recorded two hits in each of the six games. Abraham Almonte leads the Pacific Coast League with six doubles. 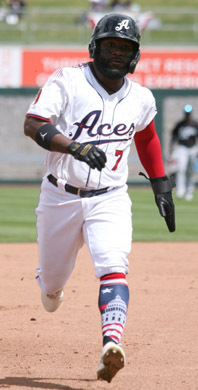 Former Aces outfielder Socrates Brito led the team with 24 doubles last season. … There was a paid attendance of 3,348. On Deck: The Aces, 3-8, face El Paso for the fourth and final game of the seven-game homestand at 1:05 p.m. Taylor Widener is expected to start for Reno. Logan Allen is the anticipated starting pitcher for the Chihuahuas. Cody Decker and Abraham Almonte get fired up before the game.